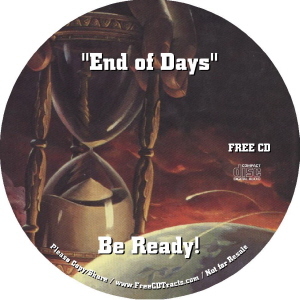 THE PICTURES HERE ARE COVERS OF CD,S WE HAVE TO GIVE YOU FREE FOR THE ASKING.OUR NEWEST CD TITLED 'THE LAST DAYS SHOULS BE HEARD BY EVERY BELIEVER AND OPASSED ON TO UNSAVED FRIENDS. WE ARE LIVING IN THE LAST DAYS BELIEVE IT OR NOT. always, to the end of the age." 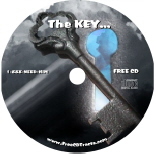 This CD Tract targets the lost as well as those who are not prepared for these last days. 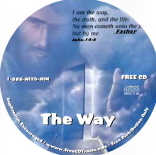 After listening to this CD Tract it's my prayer you will be convinced of how late we are in God's prophetic time clock. There is such a sense of urgency to get this warning out to as many who will listen. The door of God's Ark is nearly shut as the fullness of the Gentiles quickly nears completion. Get into God's Ark today. Help us here at FreeCDTracts.com get this warning out to as many people around the world. There isn't much time left. For the time is short. Today is the day of salvation. The signs are visible all around us. Endless war seem to rage in Iraq and Afghanistan and the war on terrorism is spreading to nearly every corner of the globe. Since 2000 alone, America has been mired in conflict in Sierra Leone, Yemen, East Timor, Afghanistan, Philippines, Cote d'Ivoire, Iraq, Liberia, Georgia, Haïti, Pakistan, Lebanon, and Somalia. Other conflicts are raging in Darfur, Saudi Arabia, Central African Republic, Democratic Republic of Congo, Thailand, Chad, Gaza Strip and the West Bank in Israel, Niger and Mali, Kenya, and Sri Lanka. 63 people were killed in the 1989 Loma Prieta quake -- which struck the San Francisco area. 230,000 (and perhaps as many as 290,000) people in 12 countries -- including about 168,000 in Indonesia alone were killed in the 2004 earthquake just off the west coast of the island of Sumatra, and the tsunami that followed. We're hearing of an increasing scarcity of food on a worldwide scale, due to increased consumption in growing countries such as China and India and rising fuel costs. These shortages have caused riots in some places and some predict the future outbreak of wars fought over increasing food scarcities. The twentieth century was an unprecedented period of change and the twenty-first century is proving to be even more dramatic. At no time in history have more changes occurred in science and in the political structure of the world. More changes occur in science in a single year than formerly occurred in a century.